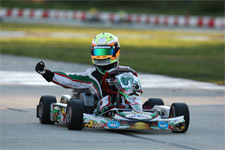 After taking in the third event weekend of the 2013 World Karting Association (WKA) Manufacturers Cup program at the New Castle Motorsports Park facility in New Castle, Indiana in mid-May, Anthony Gangi Jr. is set to return to WKA action this coming weekend. Claiming six top five-results in New Castle, the up-and-coming pilot will take on the Jet Karting of MRP facility in South Bend, Indiana for round four and is aiming this time for the top step of the podium. With his continued consistency despite some engine woes in events prior, the New York resident is now in position to attack for multiple championships with only three events remaining. 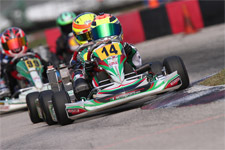 After taking several wins in the opening two rounds, Gangi Jr. would leave the New Castle round winless, but the rising talent still managed to challenge for podium results throughout the weekend. In Saturday's Komet Sportsman 1 division, the GT7 Motorsports pilot would never run outside the top three. 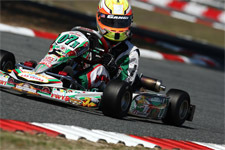 Qualifying in the second position and claiming the fastest lap of the race and a third place result in the prefinal, Gangi Jr. would hold station in the day's main event to score a solid third place result. Also seeing action in the Cadet Sportsman and Yamaha Sportsman ranks, Gangi Jr. would continue his streak of top-five results at the ultra-fast New Castle facility. 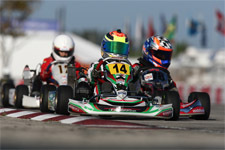 Starting with the Cadet category, the 2013 Florida Winter Tour champion would start his quest for victory by qualifying on the inside of row two. An incident in the prefinal would see the talented competitor retire from action on lap four and be forced to start his main event from the 18th position. Utilizing the draft to perfection all race long and never one to give up, Gangi Jr. battled his way back forward and claimed his second third place result of the weekend. 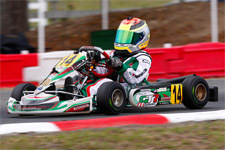 Yamaha Sportsman would see a much more consistent drive from Gangi Jr. and his Tony Kart in round three action, as he turned his third place qualifying effort into a third place finish in the prefinal. Working hard to score the victory, Gangi Jr. would be unable to hold his competitors at bay and garnered a fifth place finish. Back to the track on Sunday to complete his run at New Castle, a new day would greet the multi-time race winner with three more chances at a victory. Komet Sportsman 2 would see Gangi Jr.'s best drive of the weekend as he advanced forward from his third place qualifying position to take the checkers in the prefinal. Also claiming the fastest lap of the race, Gangi Jr.'s Tony Kart would be the one to beat in the day's main event. The final would see much of the same for Gangi Jr. as he was once again at the front of the field. Once again scoring the fastest lap of the event, the future motorsports star would have to settle for a second place podium result. Cadet Sportsman on Sunday would see Gangi Jr. never run outside the top four. 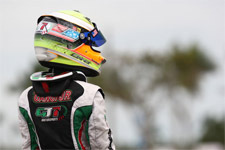 After qualifying his ride in the third position and finishing second in the prefinal, Gangi Jr. would start the main event from the outside of row one. Falling back early but working hard to run in the lead group, Gangi Jr. would cross the stripe fourth in one of the closest finishes of the weekend, narrowly missing the win by 0.194 seconds. Racing is never easy and Gangi Jr. had his work cut out for him after the Yamaha Sportsman qualifying as he would see himself mired back in the 13th position. Knowing that he would need to have a good run in the prefinal to give himself a shot in the final, Gangi Jr. advanced seven positions to finish sixth. 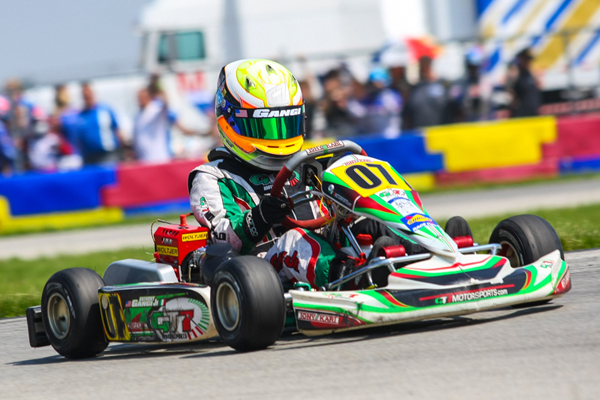 Advancing one more position in the day's final, Gangi Jr. would cross the line in the fifth position and added a total of six top-fives results from the WKA New Castle round to his already impressive resume. With three event weekends in the books, Gangi Jr. is in the hunt for four class titles. Currently sitting third in the Komet Sportsman 1 point standings and leading Komet Sportsman 2, he also sits fourth in both the Cadet and Yamaha Sportsman ranks. Turning up the wick for the second half of the season, Gangi Jr. will look to get back to his winning ways and challenge for the championship titles. As a gear up to this weekend's WKA event, Gangi Jr. took in some Great Lakes Sprint Series action at the Jet Karting facility last weekend. Earning second and third place results over two days in both Cadet Sportsman and Yamaha Sportsman, the GT7 Motorsports pilot will now look to better his results and top the blocks in his WKA classes this weekend. Anthony would like to thank his tuner and driver coach Chris Perez, Mike Doty of Mike Doty Racing and Daniel Woltjer for their continued support, as well as his karting sponsors Millwork Solutions Inc., Holeshot Drive Systems and PKT Axles.